I’ll say it simply: Penang’s food is some of the best in Asia. If this weren’t true, I never would’ve stayed in George Town for 16 days. Food dominated my decision-making, and with every meal a culinary adventure, I couldn’t leave. In my time there, I learnt that the best meals are sold at the road-side stalls called “hawker stands”. These are the same stalls that Singapore banished in its bid to clean up the city. If this happened in Penang, there’d be revolution. 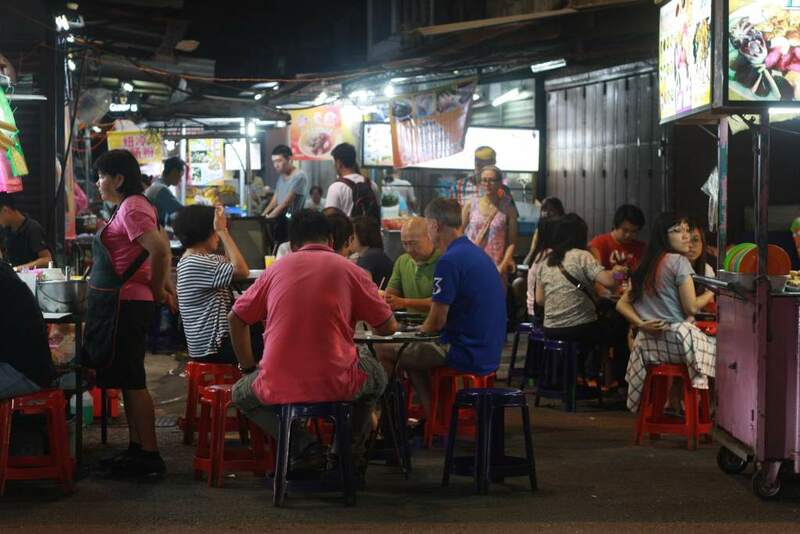 Hawker stands clog every street, overflowing from street corners like a broken dam. Penang’s call for delicious food is heeded by these tireless servants, who slave over their stoves day and night. With seemingly unlimited choices, the amount of eating is overwhelming. 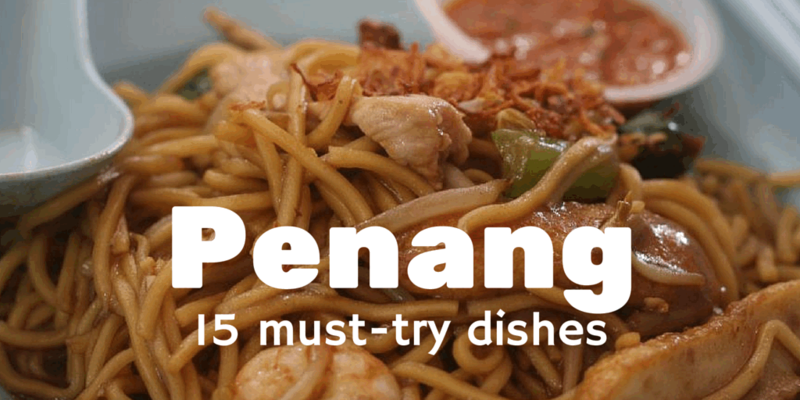 To save you from retreating to an air-conditioned restaurant, I’ve created this Penang food guide of 15 must-try dishes. 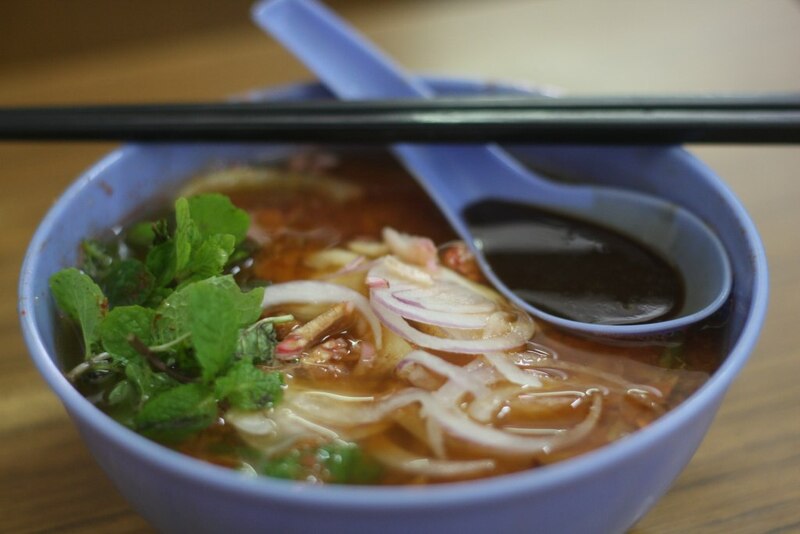 Penang’s most famous dish, asam laksa is a spicy-sour tamarind fish soup. It’s served with shredded fish and thick noodles, while the stock gets its intense flavour from onion, chilies, tamarind, mint and torch ginger. 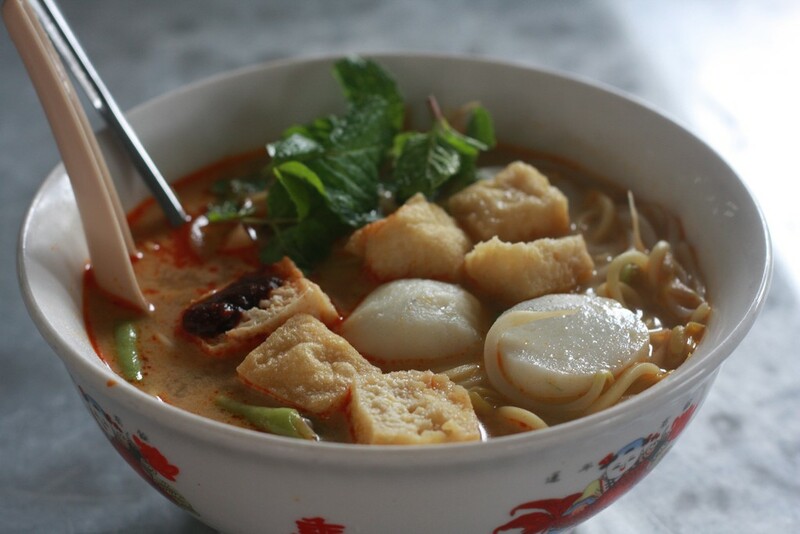 Unlike other laksas, this one is not creamy and the sharp taste can take a little getting used to. But once you do, you’ll crave it all the time. If there’s only one dish you try in Penang, make it asam laksa. 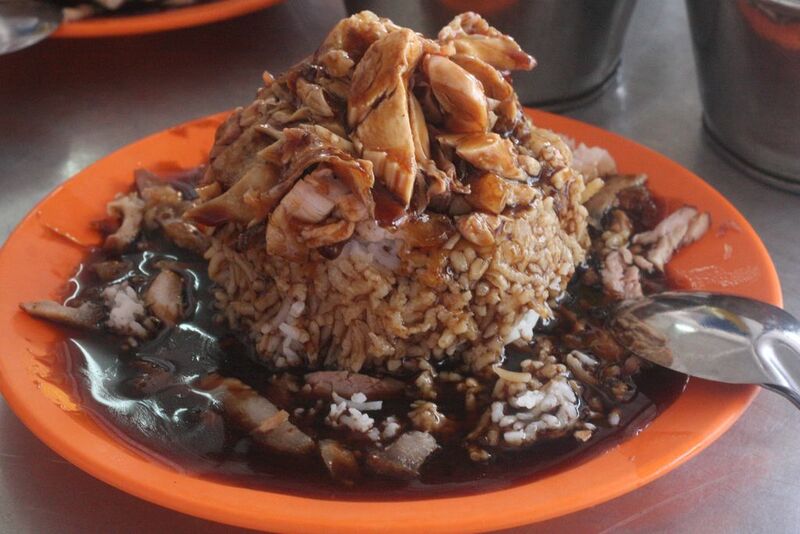 It’s the top pick of my Penang food guide. Curry mee is a satisfying and salty noodle soup. The stock is curry based, with tofu, chicken and fish included. 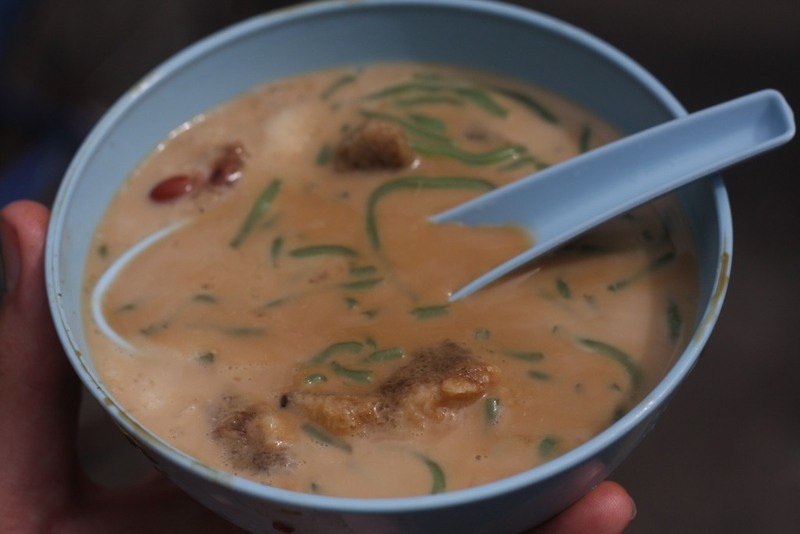 The soup’s creaminess comes from the coconut milk and bears a resemblance to Singapore laksa. 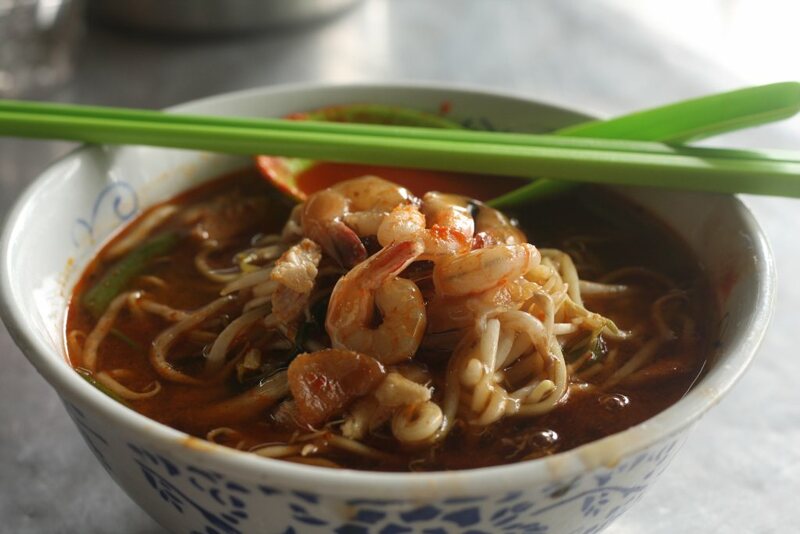 Prawn mee is another popular noodle soup. 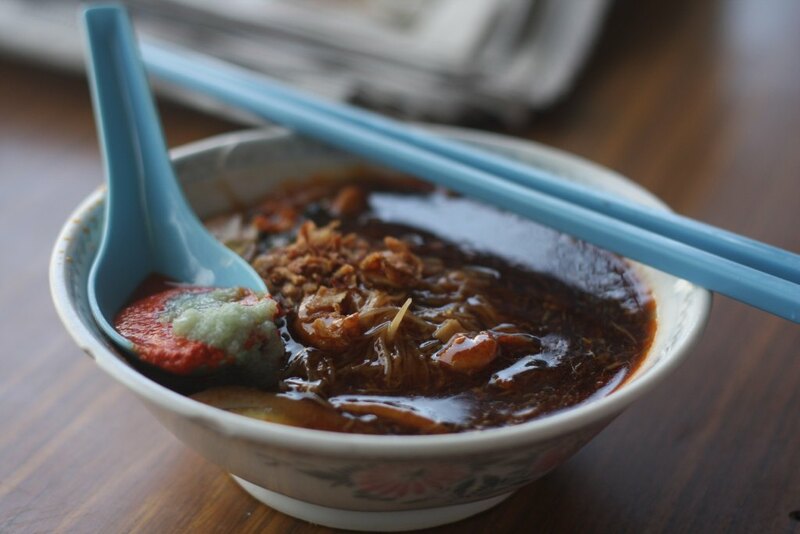 Also called hae mee, it features noodles served in a red stock made of dried shrimps, prawn heads, garlic and white pepper. The soup’s flavour is extremely rich, making it something to enjoy in moderation. 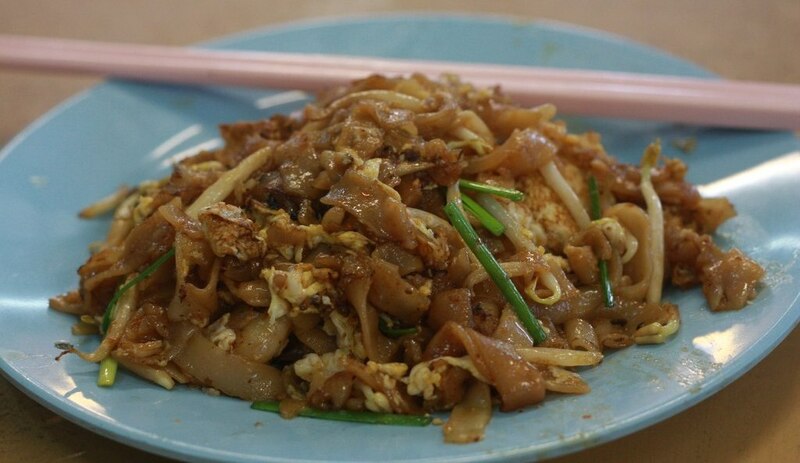 I wrote about char kway teow before, but Penang’s version is the best. I’ve heard of people traveling from Singapore just to eat this $1.50 dish in George Town. When the plate of smoky and wonderfully fatty noodles is handed to you, you’ll understand what the fuss is about. Char bee hoon is super cheap fried noodles. Cooked in batches in giant woks by the roadside, it makes a perfect snack between meals. At roughly thirty cents per serving, it’s all carbs, but can be garnished with sambal, chilies and pork-crackling for some extra substance. Another cheap snack, popiah is a type of fresh spring roll. 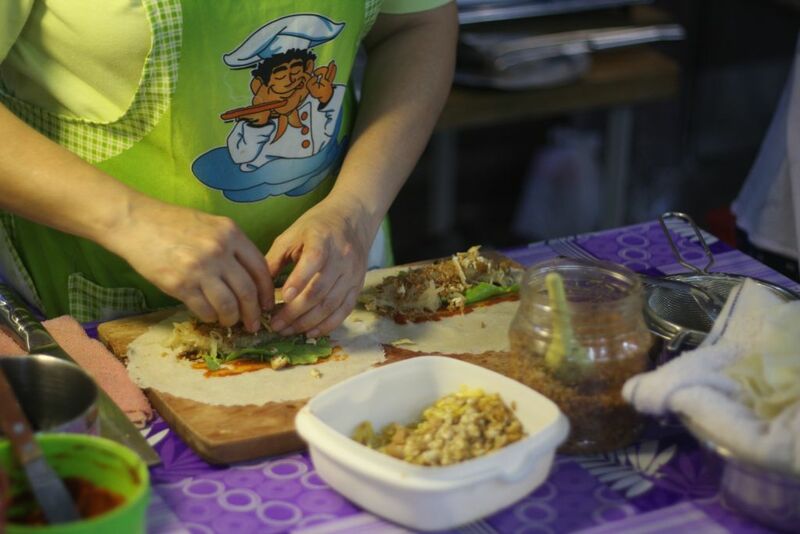 The popiah I tried had lettuce, ground turnip, bean sprouts and peanuts as filling. The thin crepe outer layer gave the popiah a satisfyingly soft texture, and a hot chili sauce provided the necessary flavour-kick. If fried oysters sound like pure indulgence, then you’re totally right. 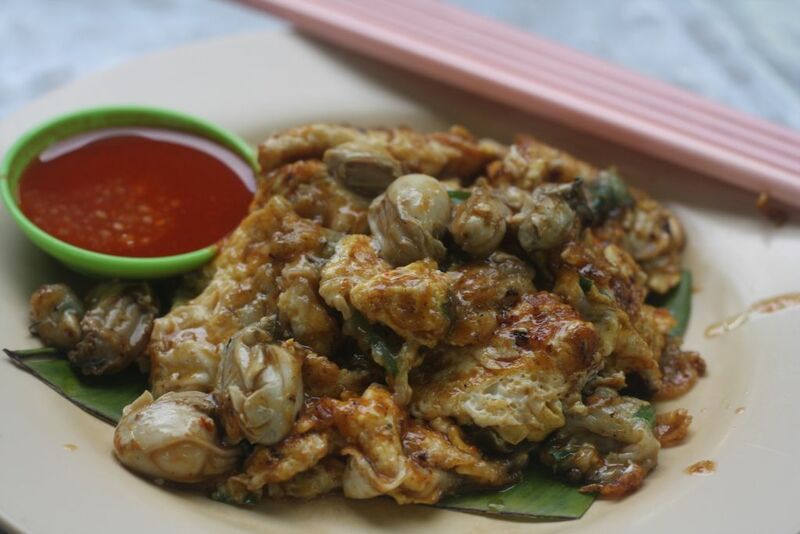 Juicy oysters are cooked with eggs and starch to produce this delicacy. Crispy versions are available, but mine was gooey in texture. At $2.30 (7 ringgit) per serving, these were the cheapest oysters I’ve ever eaten. Loh mee is worth hunting down. It’s a simple dish of noodles in an incredibly thick gravy. The consistency makes it a real challenge to pick up the noodles without dropping them, but it’s so moreish that you’ll persevere. Chili and garlic are added to provide some necessary spice. This isn’t in Penang but is too good to ignore. Bukit Mertajam is a small town on the mainland, and my friend was kind enough to take me there just to try this. The rice is steamed in a small steel bowl and then served upside-down on a plate. Generous helpings of roast pork and chicken are lavished on top of the rice, before a braising sauce is added. This sauce soaks into the meat and rice to make an immensely satisfying meal. Toast. Yes, you read that right. I waited half an hour for a table down an alleyway selling toast. Fortunately, it was no ordinary toast. 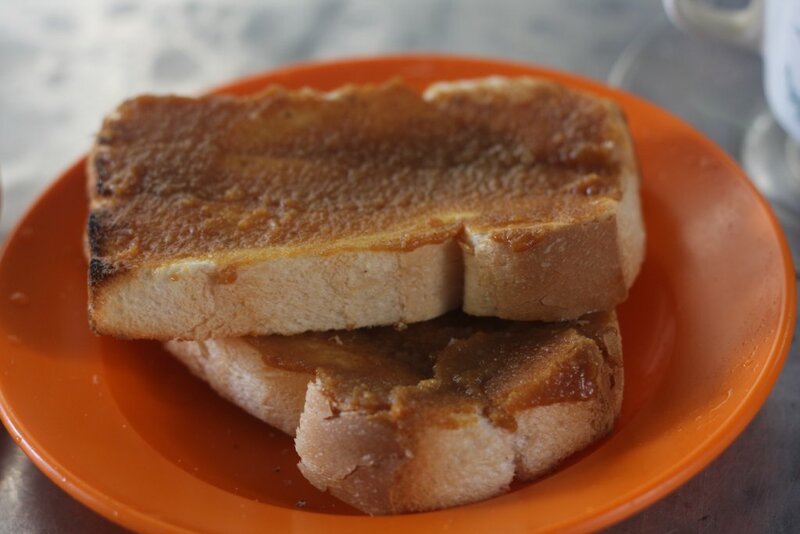 Cooked on a spade inside a roaring furnace, the thick bread was then covered with kaya (coconut jam). The rich creaminess of the coconut made the perfect tropical spread. Roti, an India flatbread, was my go-to breakfast in George Town. Similar in appearance to a pancake, the cooking process is mesmerising. The cook tosses and spins the dough in the air before frying it. The piping-hot bread is eaten by hand and is worth burning your fingers on. 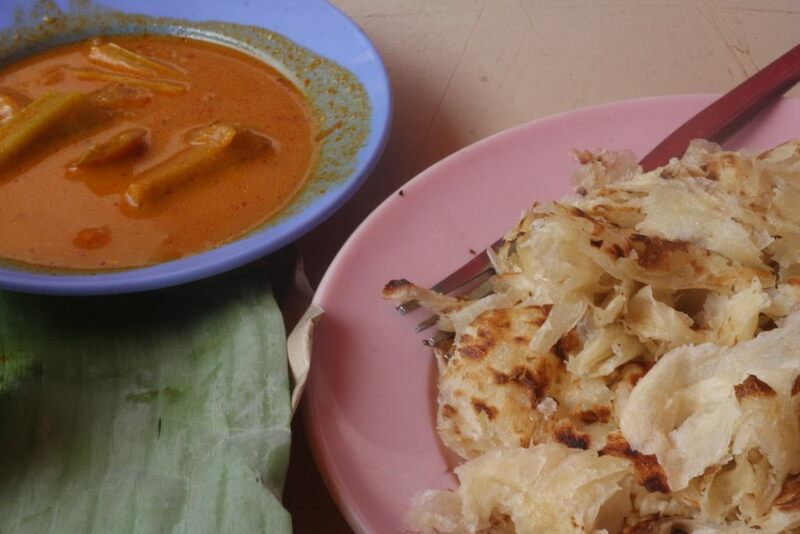 Although tasty on its own, roti canai is always served with a bowl of dhal (lentil curry) for dipping. Some people pour the curry on the roti and eat it with a fork. Eggs can also be cooked with the roti to provide some extra bulk. 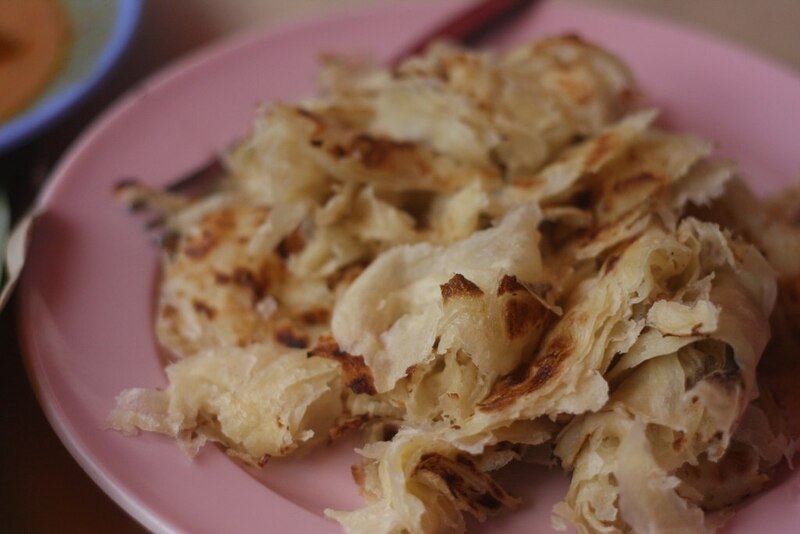 Roti canai is normally savoury, but sweet versions are available. Roti pisang (banana) was a revelation to me. Banana is cooked into the bread and when dipped in the dhal combines to create the most incredible flavour. Curry and banana sounds like an unholy mix, yet was one of the best culinary surprises I’ve ever had. 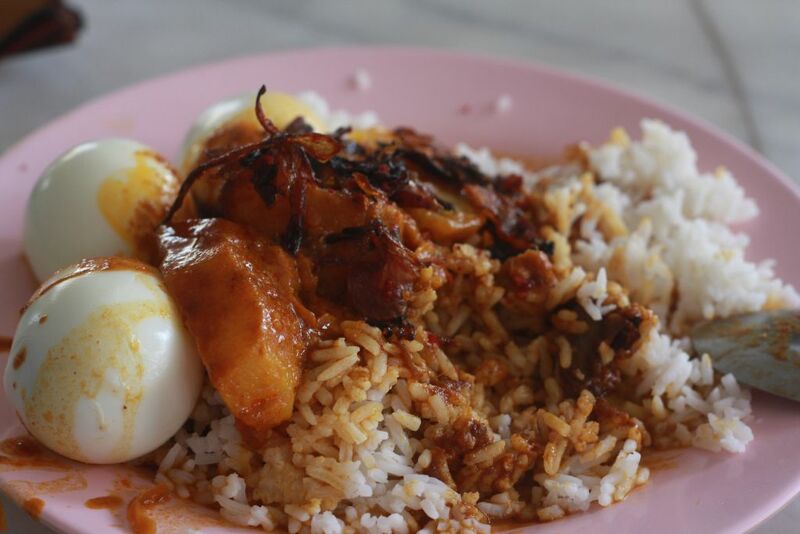 Nasi lemak is rice cooked in coconut milk and garnished with spicy sambal, fried anchovies, hardboiled egg and roasted peanuts. It’s easy to find, just look for small bundles wrapped in a green (pandan) leaf. It’s a popular breakfast, and its portable nature makes it a convenient snack. 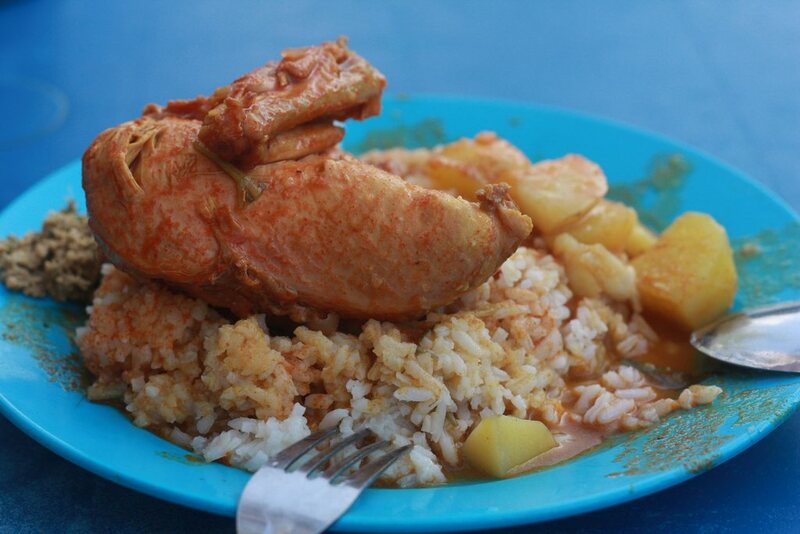 Nasi kandar comes from Penang, and is one of my favourite dishes. It comes from a time when rice hawkers would carry a kandar pole on their shoulders, with containers of rice balancing at each end. Today it’s sold buffet style, and you pick the dishes you want with your rice. My preferred options were chicken, hard boiled eggs, steamed veges, and potato, all covered in delicious curry sauces. 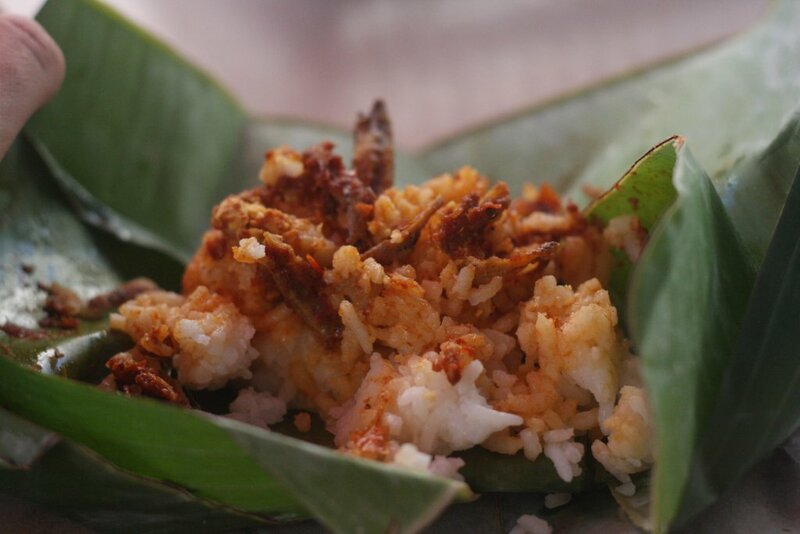 Nasi dalca is rice served with meat, usually a succulent chicken leg. On the side comes some coconut chutney, which is delightfully tangy and spicy. The real star however is the rice, cooked in such a way that it absorbs the flavours of fragrant curry. Combined with the juicy chicken and coconut chutney, this was a meal I enjoyed more than once. Looks disgusting, tastes amazing, and is more addictive than heroin. Pronounced chen-doll, this traditional dessert is the perfect antidote for the hot Malaysian sun. 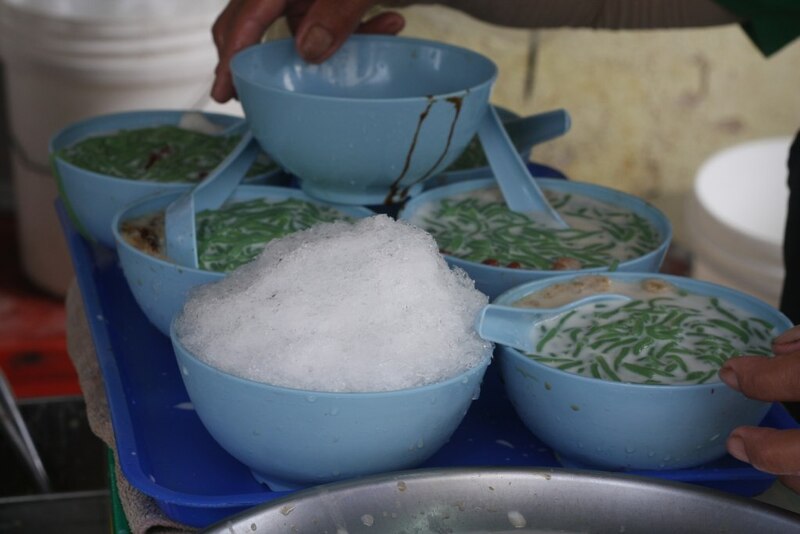 Cendol is made by taking shaved ice and covering it with palm sugar. Mung beans are added, followed by jelly noodles which get their green colour from pandan leaf. The pièce de résistance is an inundation of fresh coconut milk. Taken together, the result is an ice-cold dessert that tastes amazing and refreshes you like nothing else. At $1 a cup, it’s ridiculously cheap, and has been declared a Malaysian heritage food. This gives you an idea of some Penang foods to try. But this list is not comprehensive. There are many delicious items I’ve omitted – mee rebus, rojak and ice kacang to name only a few. In Penang there’s an unlimited amount of amazing eating options. 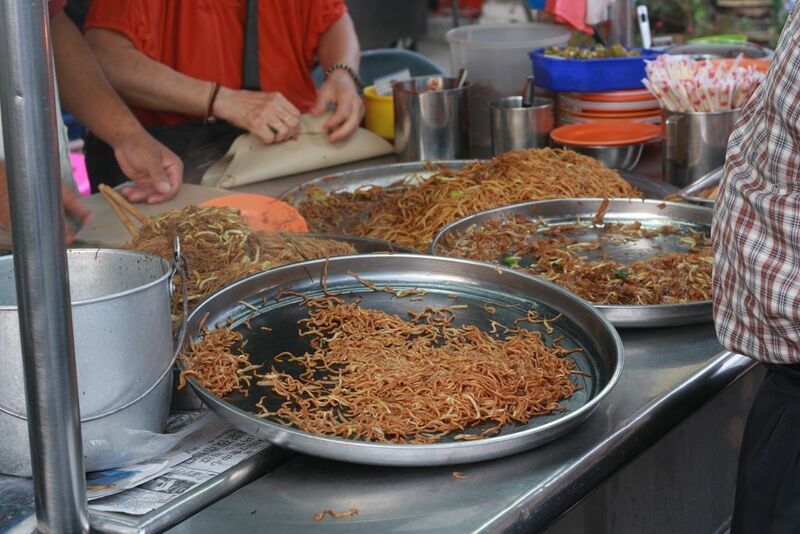 Use my Penang food guide as a place to get started. well Dan that certainly got the gastric juices on the run. How interesting, the way they combine and cook their food sure does leave me in the ‘wings’ so to speak. As always look forward to your next blog. Thanks to you, Mr. Helpful, I really enjoyed Nasi dalca, Roti canai, and Cendol! You are making miss home Daniel!